My children love animals. A trip to the pet shop to see the fish and small pets is a weekly occurrence! 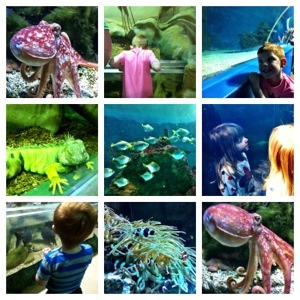 Blue reef aquarium in Tynemouth is on our doorstep and we usually visit once a year, usually in the winter. This year, I really thought my 2 year old would LOVE it, as he screams when we have to leave the fish at the pet shop. We had 2 kids go free vouchers in the primary times magazine from school and as Jack was under 3 he got in for free. It still cost us £18 entry plus £2 parking though, which in my eyes is still too expensive. I was disappointed with our visit this time as it only took us about 45 minutes to get around the whole centre. There were no extra activities on for half term, no staff on hand giving talks/feeding animals/leading rockpool handling sessions and there have been no new attractions built in the past few years so it all just felt a bit old. The aquarium has tropical fish, flat fish and crabs that you can look at. There are also 2 otters but every time we've been they've been asleep in their dens and not visible. Outside there is a seal pool which is perhaps the highlight of the visit - you can watch the seals under water as well as from above . Randomly there are a few chickens next to the seals with a very small outdoor play area for the children. Back indoors there are some very cute marmosets and an iguana which are always very active and funny to watch and to finish the trip you walk through a glass tunnel with fish and small sharks swimming around you. All of this takes less than an hour and for a discounted £20 just isn't good value for money for me - not when we could go somewhere like whitehouse farm for the whole day for the same price. Unfortunately, I don't think we will go back to the aquarium and my children will have to make do with watching the (free) fish at the pet shop for now. We went last year and it looked old then...We were in and out within about 45 minutes too....The kids were not that impressed....I wasn't either....Costs too much for what it is!! We won't be back in a hurry! !